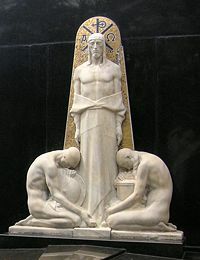 Christ as Alpha and Omega, depicted with the Chi-Rho and Alpha-Omega symbols behind his head. Alpha and Omega (Greek: Αλφα and Ω) is an appellation of God in the Book of Revelation (verses 1:8, 21:6, and 22:13). Its meaning is found in the fact that Alpha (Α) and Omega (Ω) are respectively the first and last letters of the Greek alphabet. Twice when the phrase appears, it is clarified with the additional title "the beginning and the end" (21:6, 22:13). Some thus see the term "Alpha and Omega" as a paraphrase of Isaiah 44:6: "I am the first and I am the last; apart from me there is no God." While the context in the Book of Revelation is clearly related to this, Jewish scholarship shows that the Alpha and Omega is also a Hellenized form of the rabbinical dictum: "The seal of God is Emet (Truth)," the word Emet (אמת) being derived the first, middle, and last letters of the Hebrew alphabet. 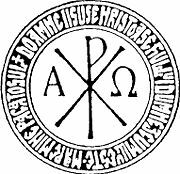 In the early church, the Alpha-and-Omega symbol became Christ's monogram and is still used in Christian art, often in combination with the Greek letters Chi and Rho, the first two letters of the word for Christ in Greek. Traditionally, the phrase is used in Christianity as evidence for Jesus' divinity and unity with God the Father. An alternative interpretation is that Christ, as the "last Adam" (1 Corinthians 15:45), represents the fulfillment of God's ideal relationship with humanity, rather than being God Himself. The Hebrew for Truth is Emet. It is composed of three letters: Aleph, Mem, and Tav. The Aleph and the Tav are the first and last letters of the Hebrew alphabet, equivalent to the Alpha and Omega in the New Testament scripture, which was originally written in Greek. The fact that the word Emet begins with the first letter of the alphabet and ends with the last led the ancient Jewish rabbis to see in this word a mystical meaning. God's absolute perfection is expressed in Isaiah 41:4 and 44:6 by the phrase, "I am the first and I am the last; apart from me there is no God." The phrase fitly expresses the idea that God is unique and eternal, the beginning and end of all that exists. As the first letter of Emet, Aleph denotes that God is the first of all beings. There was no one before Him of whom He could have received the fullness of truth. The Tav, or last letter, in like manner, signifies that God is the ultimate being. There is no one higher than He, and there will be no one after Him, since He is eternal. Thus Emet is a sacred word expressing that in God, truth dwells absolutely and fully. In the Talmud (Yoma 69b. ; Sanh. 64a. ), the following is related: "The men of the great synagogue prayed to God to remove from the earth the Evil Inclination, as the cause of all trouble. Immediately a scroll fell from heaven with the word Truth (Emet) written on it, and a fiery lion immediately came out of the sanctuary. It was the spirit of idolatry leaving the earth." Said the ancient sage Rabbi Hanina, "This legend shows that the seal of God is truth." Alpha and Omega with Chi-Rho symbol within a circle containing the words of the "Jesus Prayer" of Eastern Orthodox Hesychast tradition in Romanian. The tradition of expressing God's eternity by means of the first and last letters of the alphabet seems to have been passed down from the synagogue into the early church through the Book of Revelation, generally recognized by biblical scholars as having been written by an author whose first language was either Hebrew or Aramaic. In place of the Aleph and Tav, the Alpha and Omega were substituted in the Greek text. However, the substitution of the Greek letters for those of the Hebrew tongue inevitably caused a portion of the meaning and beauty in this designation of God to be lost, for the Greek letters Alpha and Omega have no relation to the word "Truth." Although Alpha indeed happens to be the first letter of the Greek word aletheia (truth), Omega is not the last letter, as is Tav in the word Emet. In the Greek, the sacred and mystical word "Truth," expressed in Hebrew through the letters Aleph and Tav, had to be sacrificed. The Gospel of John, after stating that the "Word was God," (John 1:1) says, "and the Word dwelt among us full of grace and truth." (John 1:14) "Grace" here carries the idea goodness, and the phrase is virtually identical with Exodus 34:6, in which God is described as "full of goodness and truth." Thus, the writer of this verse expressed the two great divine attributes, Truth and Goodness, assigning them to Christ in all their fullness. What the Hebrew Bible had said of God, John the Evangelist thus says of Christ. In the Book of Revelation, the "Alpha and the Omega," represents both God (1:8, 21:6) and Christ (22:13) in different verses. This provides evidence that the book's author believed in the divinity of Christ. However, this argument has been weakened by textual criticism, which reveals that the most direct reference to Jesus as the Alpha-Omega is not found in some of the earlier and best manuscripts. In traditional renderings of Revelation 1:11, it is the glorified Jesus who states: “I am Alpha and Omega, the first and the last.” However, the occurrence in 1:11 is not found in some of the oldest Greek manuscripts, including the Alexandrine, Sinaitic, and Codex Ephraemi rescriptus. There verse is, therefore, believed by most critical scholars to be spurious and is omitted in many modern translations. An alternative interpretation of Jesus as the Alpha and Omega is that he represents the fulfillment of God's original ideal for the relationship between humans and God, rather that being identical with God the Father. Coin of the Emperor Magnentius, with an Alpha-Omega symbol on the reverse. In early Christianity, the Alpha and Omega were often used as the monogram of Christ. These letters thus became Jesus' crest. The Alpha-Omega symbol was often written under the arms of the cross within a circle or triangle. In later centuries the cross took the form of the Chi-Rho, derived from the first two letters of "Christ" in Greek. Often the Alpha is found on the right and the Omega on the left, to indicate that in Christ the beginning and the end are joined into one. This crest is found on the coins of the emperors Constans, Constantius, and Magnentius. Since Constantius was an Arian and thus a "heretic," this tells us that the symbol was not limited to "orthodox" use. Wealthier early Christians sometimes had the two letters engraved on their signet rings, confirming the Jewish concept (whether consciously or not) of the Truth (which the Christians believed to be incarnate in Jesus) as the "seal of God." Sometimes the Alpha and the Omega are written in the nimbus, or halo, of Jesus as the Lamb of Revelation. Examples of the Alpha and Omega in Christian art include the paintings in the catacombs of Peter and Marcellinus in the third century, as well as the frescoes and mosaics of several ancient churches, including the chapel of Saint Felicitas and Saint Mark's church in Rome, and the mosaics of Ravenna. In the course of time, the Alpha and Omega ceased to be used as the monogram of Christ for church paintings and ornaments in Catholic tradition, although in recent years it has begun to reappear. It is also used in Orthodox iconography and has also found popularity in Anglican and other Protestant traditions. The symbol can often be found on many Christian tombstones. 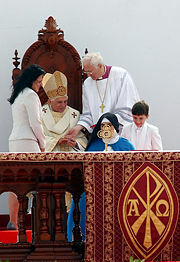 More recently, the Alpha and Omega has been used as a logo on Christian tee-shirts and baseball caps, and has also been adopted by various mystical and neo-pagan traditions, symbolizing the unity between God and humans. Tattoo artists often include the symbol in their repertoires, and it has also been used as the logo for various businesses and the title of several rock and roll albums and bands. History of "Alpha and Omega"
This page was last modified on 9 March 2016, at 15:09.